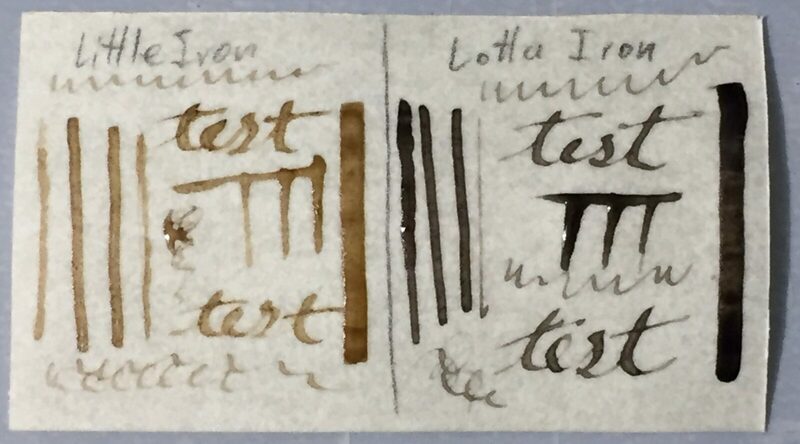 So I noticed that While I had soaked a bit of rusty iron in the ink, while cooking it down had started to make it darker, it would get even darker on the nib. Mind you it wasn’t eating the nib any more than normal but I was getting black caking, which could be wiped off without too much trouble. At the suggestion of Heather Rose, I picked up some Iron Supplements at the local wal-mart. I put about 10 fl oz. in another jar and added two crushed tablets. This seems to have done the trick. 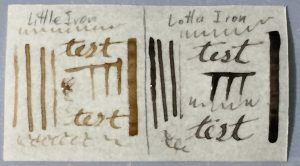 Instead of collecting on the nib, the ink now darkens as it dries on the paper. Now to let it sit in the sun for a few months and see how well it holds up!